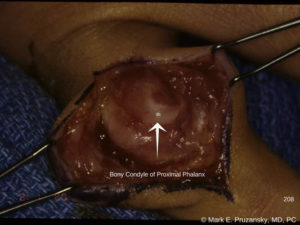 Volar dislocation proximal interphalangeal joint, with proximal phalanx head between central slip and lateral band. What is Interphalangeal Joint Dislocation? The interphalangeal joint is a hinge joint located between each finger, allowing only for flexion and extension. The ligamentous complexes consist of the volar plate providing stability against dorsal dislocation of the phalanx and hyperextension injury. Interphalangeal (IP) joint dislocations to the fingers are common, usually occurring due to forced hyperflexion or hyperextension. This is a serious injury that requires immediate reduction in order to find out if integral structures of the hand were damaged. When someone experiences an interphalangeal joint dislocation, they often experience diffuse pain, swelling, and tingling sensations in the affected finger following the trauma or injury. Other symptoms may include discoloration of the affected digit, which is a serious condition that should be seen by a specialized hand doctor as soon as possible. Dorsal PIP dislocation is the most common type of interphalangeal joint dislocation. Associated injuries include dislocations of the distal interphalangeal joint, proximal interphalangeal joint, and tendon rupture. Upon injury involving vertical compression and hyperextension of the fingertip, the volar plate of the joint may tear or become displaced. 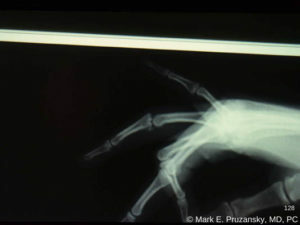 This injury causes a dorsal dislocation of the proximal interphalangeal or distal interphalangeal joint. It may be associated with an avulsion fracture at the base of the phalanx. Patients whose digits have an open joint dislocation, joint instability, ligamentous or volar plate rupture, a neurovascular compromise, or an associated fracture should seek immediate medical supervision. All interphalangeal joint dislocations should be reevaluated by a hand specialist, like Dr. Jason or Mark Pruzansky at Handsport Surgery Institute. In some cases, patients may experience diffuse soft tissue hand or foot injury, hand or foot fracture, abrasions or lacerations on surrounding areas and permanent deformity. Joint instability or neurovascular compromise after reduction requires an immediate hand consultation. Because joint instability is often obscured by extensive edema and pain immediately after the injury, all finger joint dislocations should be referred for orthopedic or hand specialist evaluation within 2-3 weeks following reduction. If you’ve injured your hand, it’s important to be seen by a specialized hand surgeon like Dr. Jason or Mark Pruzansky. With expertise in injuries of the hand, they will be able to determine whether you have an interphalangeal joint dislocation and the best possible treatment option. A physical examination can help determine whether or not you have a dislocation, but Dr. Mark Pruzansky and Dr. Jason Pruzansky may require an x-ray to be taken to confirm this diagnosis. If a patient has an interphalangeal joint dislocation, there are quite a few treatment options to help correct the problem. Depending on the severity of the injury, and whether or not there are any related fractures, Dr. Mark Pruzansky and Dr. Jason Pruzansky may recommend a conservative or surgical course of treatment. Nonsurgical options for simple interphalangeal joint dislocations may be splinting, applying ice, and elevating the injured hand. NSAIDs, analgesics, and anxiolytics are used to treat the pain associated with dislocations. Typically, a PIP joint dislocation may need to be splinted for 14-21 days, while a DIP joint dislocation usually requires 10-14 of splinting. Buddy taping for 3-6 weeks prevents hyperextension of the healing area. The cause of dislocation in children is more often ligamentous laxity in nature than rupture. The patient may have their fingers buddy-taped for 10-14 days. Your doctor may elect to obtain post-reduction radiographs to assess functional stability with stress views. Please contact us as soon as possible to schedule an appointment with our talented team. People experiencing interphalangeal joint dislocation should be evaluated to try and reduce the risk of further injury and mobility issues. If you have been injured, it’s important to be evaluated by a highly skilled professional. Call Dr. Mark Pruzansky and Dr. Jason Pruzansky at 212-249-8700 to schedule an appointment, obtain an accurate diagnosis, and start to improve the function of your hand.